The recent onslaught of new BMW products continues with the introduction of the 2015 BMW X4, officially revealed for the first time at the April 2014 New York International Auto Show. Like the larger BMW X6, the midsize BMW X4 crossover shares similar proportions and the low, coupe-like roofline. It's slightly longer than the BMW X3, but also slightly lower, with a sleeker, more hunkered-down shape, compared with the more upright silhouettes of the X3 and X5. Two models will be available, both with all-wheel drive as standard equipment: The xDrive28i is powered by BMW's TwinPower turbocharged 2.0-liter inline-4 that makes 240 horsepower and 260 pound-feet of torque. The X4 xDrive35i uses a 3.0-liter inline-6 good for 300 hp and 300 lb.-ft. of torque. BMW estimates the xDrive35i will sprint from 0-60 mph in 5.2 seconds, very brisk performance. Both models come with an 8-speed automatic transmission. Suspension on the BMW X4 is tuned more aggressively than on X3 and X5 models. The X4 suspension also features Performance Control, which uses the electronic stability control system to guide power to the outside rear wheel when cornering, reducing understeer (plowing). Meanwhile, variable sport steering allows for more stability in high speeds in a straight line, but tightens up in corners and at lower speeds for better maneuverability. Standard features will include BMW's iDrive interface, as well as a power tailgate that opens when the keyholder swipes under the bumper with one foot. Options include the usual array from BMW, like navigation, a color head-up display and the ConnectedDrive services, which allow users to pair their smartphones to access multiple apps and information. Active safety options include adaptive cruise control, lane departure warning, blind spot detection and pedestrian/collision warning with automatic braking. Subscription to the BMW Assist eCall emergency crash notification system is included for ten years. 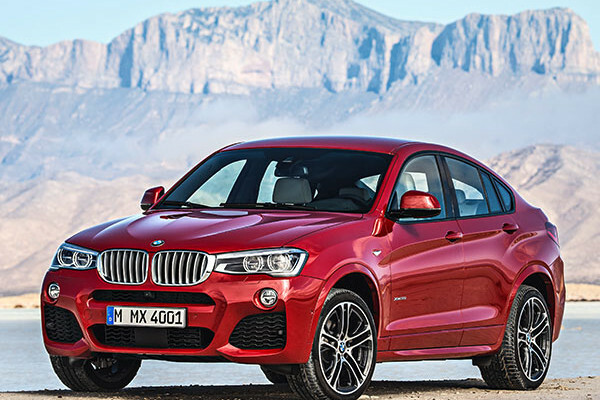 Like other BMW models, the 2015 BMW X4 will be available with an M Sport option, which adds an even more aggressively tuned sport suspension, unique interior trim, special exterior colors and an aerodynamics package. There's also a choice of 19- or 20-inch M alloy wheels. If the X6 is any indication, the 2015 BMW X4 should keep the sharp handling of a sedan, while offering additional storage. However, like the X6, the X4's low roofline makes for a less roomy interior than in the more upright crossovers. With all seats in place, the 2015 BMW X4 offers 17.7 cubic feet of space, expandable to 49.4 cubes. A standard 40/20/40-split rear seat makes the X4 more versatile. Notably, the 2015 BMW X4 will be built in the USA at BMW's Spartanburg, SC assembly plant. BMW recently announced it would expand the plant's capacity to make room for the X4 (and possibly future vehicles), which, upon completion, will make Spartanburg BMW's largest assembly plant worldwide. The 2015 BMW X4 goes on sale in the U.S. in Fall 2014 with a starting price of $45,625 for the xDrive28i and $48,925 for the xDrive35i, including destination and handling.